My Quick Mill Andreja Premium is on an electronic timer, set to come on one hour before I get up, so that it's fully up to temperature for use in the morning. 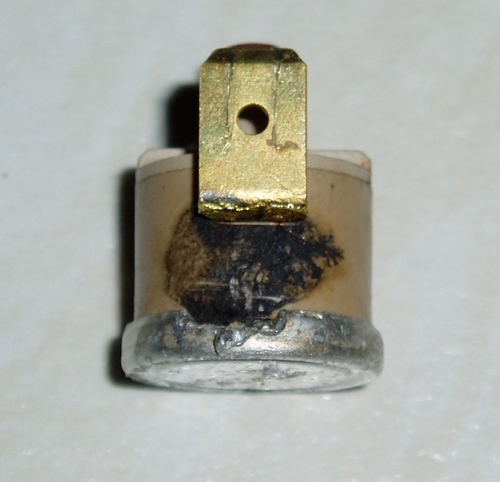 One morning I awoke to find the ring mains (and central heating) Residual Current Device (RCD) had tripped. I reset the RCD and returned to the kitchen where the coffee machine was starting to heat up. For several days preceding this, a hissing, spurting noise could be heard from inside the Andreja when first switched on. 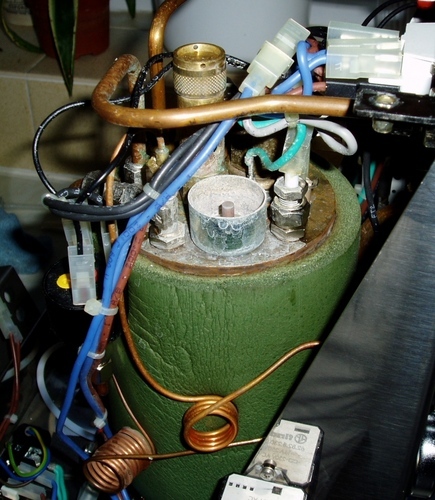 This would stop once the boiler pressure had reached 0.5 bar. 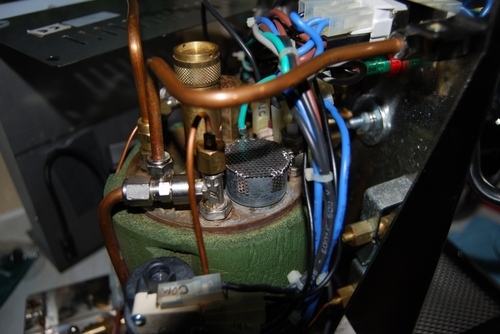 However, this time the hissing and then spurting noise was very loud and before the boiler pressure reached 0.5 bar the machine tripped the RCD with a loud bang / pop. I switched the machine off and reset the RCD. Now, each time the Andreja was switched on it immediately tripped the RCD. After unplugging the machine the casing was removed. 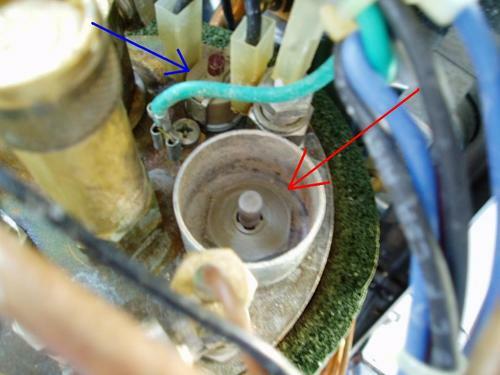 Extensive scaling around the vacuum breaker valve and splash cup was found. The water hardness in this area is 375mg/l. Anything above 300mg/l is considered very hard by the water supplier, Three Valleys water. Three Valleys Water - Hardness and Fluoride Information. Clearly scaling is a problem on this machine despite using, and regularly changing the cartridge of, a Brita jug water filter. 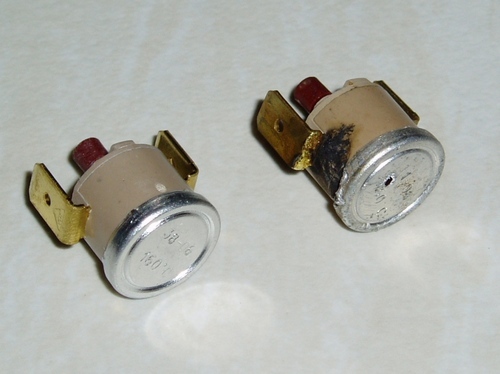 At this point the assumption was that the vacuum breaker valve (red arrow – the hexagonal nut in the cup) had scaled-up and allowed steam the leak into the casing and the subsequent condensation found inside the casing had caused an electrical component to fail. 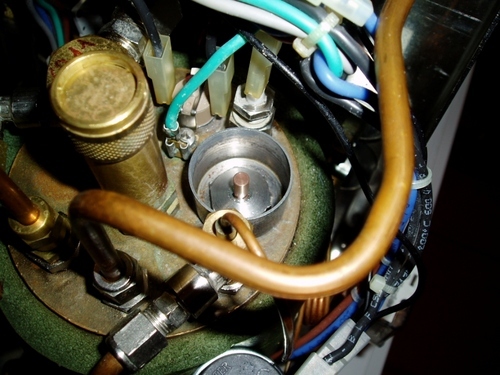 • Measuring the impedance of the heating element to check it was operational. All of the above checks where OK. Next, visual observations revealed sparking at one of the terminals of the limit stat (blue arrow – the buff coloured component) each time the machine was switch on and tripped the RCD. The limit stat (triggers if the boiler exceeds its temperature limit) was removed and by-passed. The machine then functioned correctly. This is the failed pressure stat. Failed and new pressure stats. 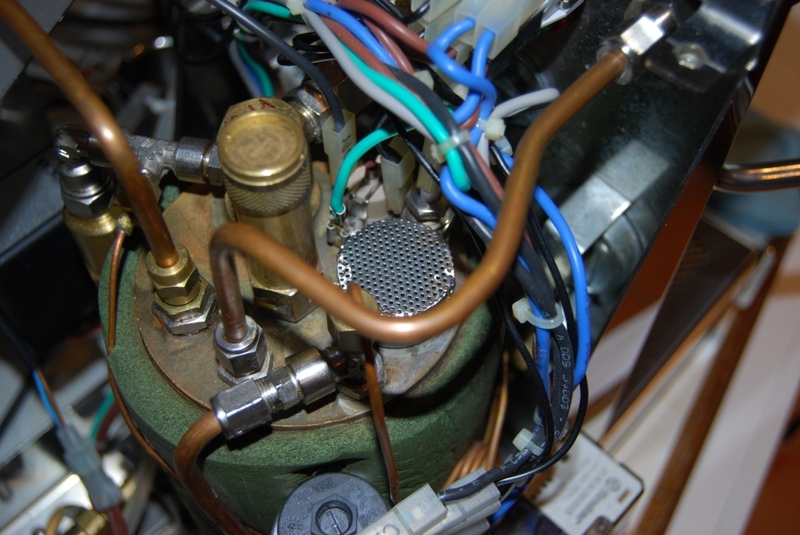 Before re-assembling the machine with the new limit stat the vacuum breaker was removed and cleaned in citric acid to avoid further condensation induced problems. To avoid a re-occurrence of the same problem a cover was constructed over the valve and splash cup. 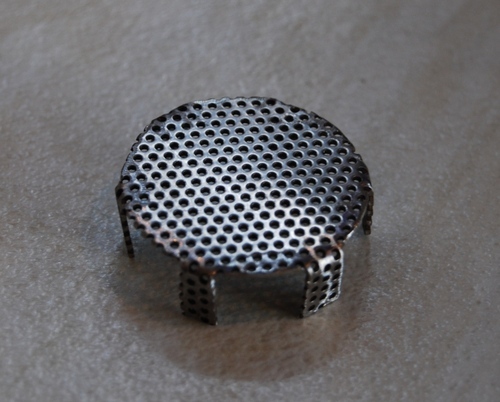 This consisted of a stainless steel mesh cut into a circle with six legs bent to 90 degrees, plus a little bit extra to grip the outside of the splash cup. The final design is slightly different to the item shown in the photograph. The mesh size (approximately 1mm diameter holes) still allowed some splashes through. Therefore, an additional layer of the same mesh was glued, with slow setting Araldite, to the top with the holes very slightly mis-aligned to make it harder for splashes to come through the mesh. Now fully functioning, the machine was put back to work.